A fearsome hitter and defensive back LJ joined the Gladiators in 2013 and tallied 85 tackles and 5 interceptions in 14 games. He got a fair amount of playing time also at kick returner in 2014, and finished with 26 kick returns for 578 yards and a TD. LaRoche has had an interception for a touchdown in every season he’s been in the AFL including 2014, when he had 3 interceptions for 74 yards, 105.5 tackles, and 2 FF, helping key the Gladiators Arena Bowl run. 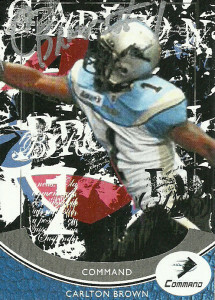 LaRoche went to little Clark Atlanta University, becoming a starter at DB in the second game of his freshman season. He held on to that spot the rest of the year, finishing with four interceptions. 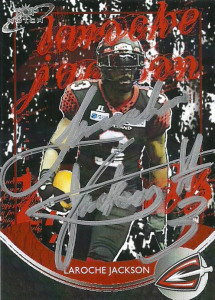 Jackson went undrafted in 2006. He’d sign with the then Carolina Speed and was named Rookie of the Year of the AIFA in 2008. 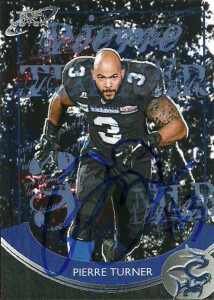 The next season he played for the Bloomington Edge of the IFL. 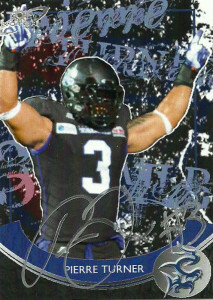 After a brief stint with the Hamilton Tiger-Cats of the CFL in 2010, LaRoche landed in the Arena Football League in 2011. 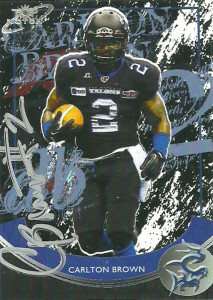 He’d swim with the Sharks of Jacksonville, earning an Arena Bowl title in his first season. En route, Jackson led the Sharks with 119 tackles, recovered two fumbles, and recorded six interceptions. In 2012, he recorded 97 tackles, another four interceptions, and a forced fumble. Great finished product and even better looking autograph, LJ really tagged this one up nice. Once I got the autographs back I thanked them through Twitter. True to the reason why I do this, I could tell that LaRoche enjoyed getting the cards as much as I did getting the autograph.